There was to be no repeat of the goalfest which these teams played out in their last meeting as the extreme heat on the hottest day of the year in the UK played its part in making it a pretty forgettable afternoon at Keys Park. 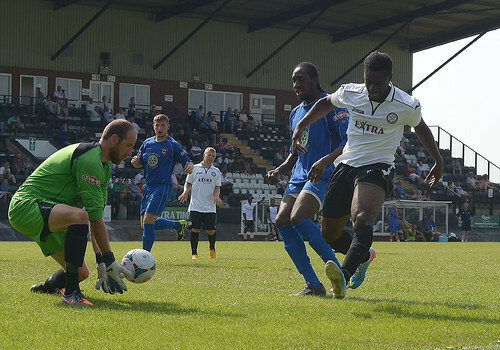 With Hednesford Town proudly wearing their new home kit for the 2013/14 season it was they who made the early running with Neil Harvey and Jamey Osborne both firing past the target on two separate occasions. At the other end both Francino Francis and Ben Bailey were able to deal with any threat that The Royals’ frontline, including former Hednesford man Mark Danks, threw at them. The game saw regular drinks breaks taking place due to the heat and it was just after one of these when the best move of the game arrived as Osborne set up John Disney who was denied with a good block. The game almost came into life just before the hour mark as first Sutton goalkeeper Lee Evans made two blocks from a Hednesford corner which was followed by the visitors breaking and Danks seeing his lobbed effort strike the crossbar before being cleared away. A flurry of substitutes from both sides saw the game enter into a lull of action in the second period. However Hednesford perhaps should have won it in the last minute as Osborne danced around three defenders before seeing his left-footed effort clip the post and go behind. The Pitmen are back in action on Tuesday 16th July when Eastwood Town visit Keys Park, 7.45pm kick off.